So GottaCon 2015 was last weekend; I managed to be at the whole convention, and it (mostly) good. Friday night I ran a Pulp Alley game. The non-tournament miniatures games at GottaCon are perpetually under-promoted, under-supported, and (unsurprisingly) under-attended. The convention doesn’t even have assigned tables for non-tournament gaming, you can just set up whereever the tournament folks aren’t using, basically. I got a grand total of one player for PA, but we still had a good game. His team of Intrepid Reporters completely and utterly beat my skulking group of Foreign Cultists, principally by being significantly more competent than them at the gathering of clues! Saturday daytime and Sunday daytime I participated in the Blood Bowl tournament with my crocodiles (Lizardmen). Won two games out of five, tied one, had a great time in all five games. Got to face off against goblins (twice), Skaven, Vampires and Norse – these last three were all new teams to face for me and made for interesting games. Both goblin games were full of the usual explosive high-risk stupid awesomeness you expect from Gobbos, the high point of that being a gob Bomber who fumbled a bomb at his feet and blew himself over, as well as every single other player in the surrounding squares, two more goblins and three crocs! The Handbag Factory – my crocodile’s amazing habit of getting themselves killed or maimed despite being among the most heavily armoured players available in BB – was in full operation. I lost Sauri every game, and even my Krox once. Thankfully it was a resurrection tournament, we started each game with exactly the same roster! 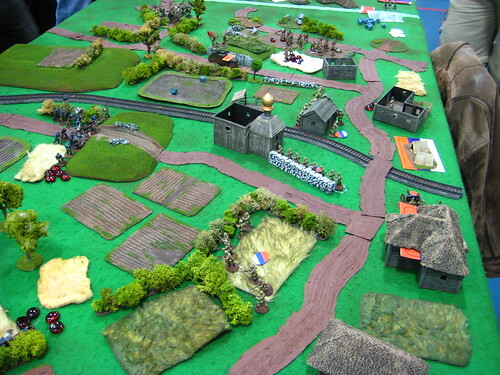 Saturday evening I ran a really good Russian Civil War game using the TFL Chain of Command rules. The defending Reds bloodied the White Cossacks good and hard, the high point being pulling off a series of close assaults on the White armoured car that ended in it being immobilized with both guns jammed in the centre of the hamlet, and the crew being bayoneted by the Red militia! The VCC is quite a change in venue from the drafty and loud old Pearke’s Fieldhouse of previous GottaCons; it’s got a few issues of it’s own (no coffee before ten in the morning!) but being right downtown is convenient for more people than the out-of-the-way Pearkes Rec Centre. Mind you, I might be biased because it’s a ten to fifteen minute easy walk to the Convention Centre from my front door! Looking forward to GottaCon 2016 next year, and in the much more immediate future, I need to start getting prepped for Trumpeter Salute 2015 at the end of March, just four weeks away! Victoria’s GottaCon is running this weekend, and as I’ve just flown back into town from a work assignment elsewhere in the province, I’m missing the entire thing! I’d go for Sunday, but having been away for five weeks I’ve got too many errands to run and non-gaming real life to catch up on. Worse, it looks like I’m going to be on a short turnaround and leaving town yet again for another work assignment later in March, so there’s a very good chance I’ll miss Vancouver’s excellent Trumpeter Salute convention this year, for the first time in four years. I was looking forward to doing either pulp gaming or Russian Civil War, too. There’s a great group of gamers and friends over in Vancouver, many of whom I only see at the Trumpeter show. That aside, I am painting again, both Blood Bowl teams and other stuff. I even took paints and figures with me on my recent field assignment, and got some decent painting done in the hotel room a couple of evenings. There’s a great group of random thugs from Pulp Figures on my desk right now, and I’m going to be stripping the paint off my Amazon BB team and re-doing them from scratch because about half of them had the primer go on sort of rough. It was an old can and I was spraying on a colder than normal day; it’s the first time in years of spray priming I’ve had that sort of finish! Short and frankly lazy day of gaming today. 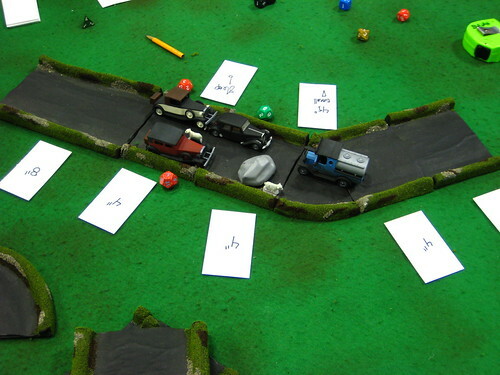 Corey and I re-ran our pulp racing homebrew from Friday evening, roping one person in. We’d tweaked the rules slightly, added actual damage to the vehicles, and the mayhem was just as pulpy, daft and destructive as ever! I spent most of the afternoon being a spectator (and forgetting to take pictures, worse luck) and blowing the last of my GottaCon budget at various vendors. I spent the lion’s share of that at TableTop Scenery on three bases of trees, each base with a pair of threes in the 5-7″ tall range. Trees are the one major pieces of terrain I’ve never gotten around to doing, as good looking, largely gamer-proof trees can be fairly challenging to make. The TableTop trees are “bottlebrush” style, with a wire core and hemp branches shaped and flocked. I also picked up a random scattering of other things – more dice, a Munchkin booster pack, and four or five Reaper fantasy figures that were on clearance at one booth. I also played a short three-turn demo of Infinity, a game I’ve been intrigued by for a while now. The game seems fast, rules light and incredibly lethal. I scored the free Intro Rules booklet (which seems fairly complete, actually) and a pair of infantry figures from the Nomad faction. I might paint them up soon, actually, just as a change from the Russian Civil War hordes that have lately flooded my painting bench. The nearly insane per-figure cost of the official Infinity figures is discouraging me from actually getting into the game, though. I know you don’t need many figures per team, but still, $10-15 for a single infantry figure puts one off. Corey spent the afternoon running a D&D 4th Edition Essentials module for three or four teenagers, but didn’t manage to kill every single one of their characters. Pity, that. I haven’t heard any official estimate of attendance from the guys who run GottaCon, but it felt busier throughout than the last couple of years, and a couple of the repeat vendors I’ve gotten to know in passing said it was a better year than previous ones for them. That bodes well for Victoria’s “big” gaming convention in it’s fifth year. The one thing that continues to bug me about GottaCon (and has since it started) is the lack of non-tournament miniatures events. I’ve basically come to the conclusion that if GottaCon is going to continue to amuse me, as a gamer, I’m going to have to continue to arrange my own amusement, in coordination with my brother and a few other like-minded gamer friends. I’ll almost certainly be running more stuff next year, possibly making the double-header Russian Civil War games official, as well as working with Corey to bring back our pulp extravaganza games in some form. I may even try to organize an RPG session using Savage Worlds or one of the systems I enjoy, as an alternative to the endless parade of 4E & Pathfinder RPG sessions GottaCon’s roleplaying track is currently clogged with. We shall see! Wound up running my Russian Civil War game twice, after interested spectators asked during the afternoon game if I was running it again during the convention. I said, “Sure, how about this evening?”, checked to see if the table was still free (it was) and wound up running the game again. Exact same forces, same terrain setup, but two wildly different outcomes. Game one was a hard-fought but unmistakable Red victory against the defending Whites; game two was an utter rout of the attacking Reds, with minimal casualties amongst the Whites. Fascinating to see such different outcomes from the same starting position. I haven’t even checked my photos from yesterday, but I did manage to get a few photos of the first game, at least. Full game report and photos (assuming they turned out!) later. Off to the Sunday gaming sessions! Spent the morning doing a few bits of last minute prep for my Russian Civil War game, mostly putting the finishing touches on the field gun and crew. Headed up to the convention site a few hours before it opened so I could get my pass ahead of time and avoid the 45 minute wait at the official doors time, then loitered in a coffee shop until just before the doors opened. Going to the will-call pre-con ticketing turned out to be a good plan, as the lines were fairly long at the ticket door! The evening session was taken up with a fairly quick, highly entertaining game of pulp racing run by Corey; the rules are super light, less than a page, and consist mostly of “roll something and make sh*t up, then everyone crashes!”. Scatter dice, FUDGE dice, card-based activation and possibly averaging dice are involved. Corey claims to have been sober when he wrote the rules, but I have my doubts. I ran over a skunk, an escaped circus elephant narrowly avoided being very large roadkill, one or two sheep weren’t so fortunate, and ultimately Our Hero crashed, his car nudged from behind by a Comically Evil Henchperson, and was unable to prevent the Dastardly Villain from marrying the Tragically Brainwashed Heroine. Pulp silliness ensued, in other words. I even remembered to take photos, and one or two of them even turned out OK! Early in the pulp racing game. The oncoming lane is blocked, there’s sheep in the middle of the road, a fuel truck has just pulled out to try to get around the obstacle, and here we come, driving idiotically fast! Standard pulp nonsense, in other words! See the full GottaCon 2013 photo set on Flickr. 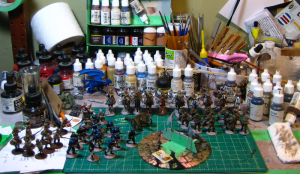 A quick look at my painting bench as a I get ready for Saturday’s Russian Civil War game at GottaCon. On the right, 15 Bolsheviks, a mix of regulars and militia/Red Guard types. Behind them across the back of the cutting matt, a unit of Russian horse. Behind them and currently being ignored, 10 American gunboat sailors from Pulp Figures. On the left of the mat, 14 Bolshevik sailors. Off the mat to the left, a batch of finished Whites from ages ago just waiting to be re-housed as I (yet again) reorganize my figure storage. Centre, a field gun — the crew are lurking behind the Red sailors. The CD has some new greenstuff banners I just primed, and a small pile of ready ammo that will form part of a loaded/unloaded marker for the field gun. All sorts of things, mostly Russians, being painted. See text for details, and click for larger! In other convention-related news, I’ve submitted my RCW game to Trumpeter Salute; haven’t had the event confirmed by the organizers yet but it’s nice to have it submitted. Right, back to the painting mines! Four days to the game! In just under three weeks our local big convention kicks off – GottaCon 2013 is February 1st, 2nd & 3rd at the Pearkes Recreation Centre. I’ll be running a Russian Civil War scenario, possibly with a Back of Beyond flavour. 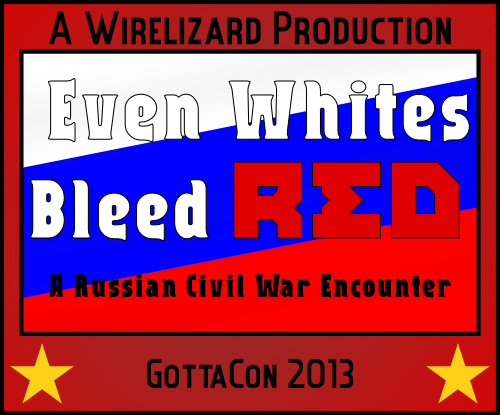 It’ll be a variant of my Even Whites Bleed Red scenario from last year’s Trumpeter Salute convention, mostly because I haven’t yet come up with a more entertaining title than that! I’ve got Red sailors, cavalry and more Red regular troopers on the painting bench as we speak, and some nice scenery bits to add to my existing Russian scenery. Now, to get off the computer and back to that painting bench! Never did write that post-GottaCon post, did I? Ran a very good game of .45 Adventures, lots of dinosaurs and mayhem. Four cars started the Jurassic Pulp race from the wrecked camp, and by the time they’d reached the safety of the river, all four cars were wrecked, one person had been stepped on by a T. Rex, another eaten by same, one had fallen off a bridge to certain doom, and other pulptastic mayhem had taken place. I actually remembered to take my camera out of my bag during the game, but true to form, only got a couple of shots worth anything. Here’s the best of those shots. 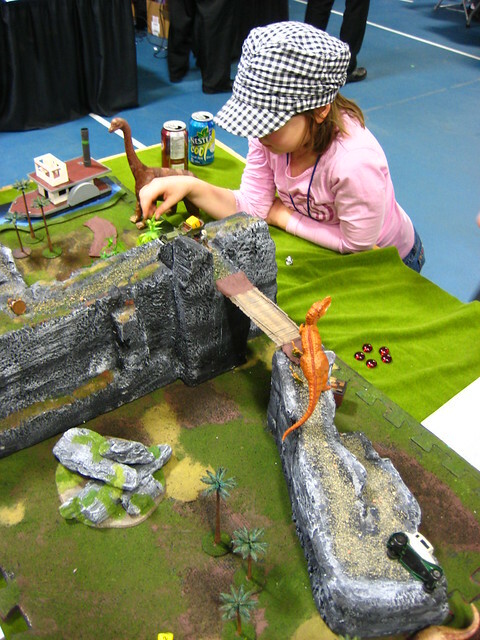 The girl is the daughter of one of my pulp players; she was awesomely patient while the strange adults shot at each other, blew things up, got trampled by dinosaurs and generally acted silly. 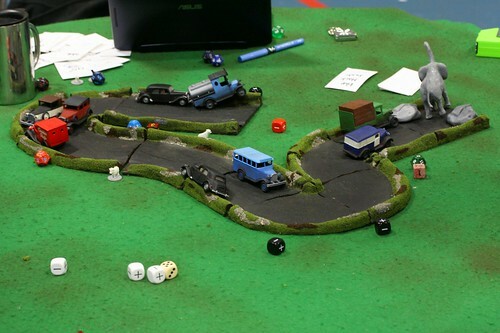 The cliff on the left is Corey’s latest scenery extravaganza, and it proved awesomely lethal during the game, although nobody actually drove off the top of it, which I had hoped to see! GottaCon reported record attendance and sales numbers, so Victoria’s “big” convention really is growing up. Now they just need to get better airflow in the sports hall the convention runs in, it gets hot, loud and airless. The non-tournament miniatures area was far better (and more flexibly) managed this year than in previous years, though, so that was a huge plus. Looking forward to GottaCon 2013! … it’s past midnight, so yes, technically it is today as I write this. Anyway, Victoria’s big gaming convention started last night (Friday) and runs through to Sunday afternoon. Saturday (today!) I will be running Jurassic Pulp II: Rex Returns for, hopefully, a sellout crowd. I’ve got six teams of two characters each, and last year’s game got five players, so hopefully I equal or exceed last year’s player count. I”ll even try to remember to get some in-game photos, although I have a lousy track record of remembering the camera even exists while in the middle of running a game! Still, there will be at least some photos. The game will feature some new terrain features that have never been photographed before, too! Final prep, bed, up early for the convention tomorrow. I’m getting up earlier, on a Saturday, for a gaming convention, than I usually have to for work. Sheesh. The things we do for our hobbies..